You are currently browsing the tag archive for the ‘breakfast recipe’ tag. 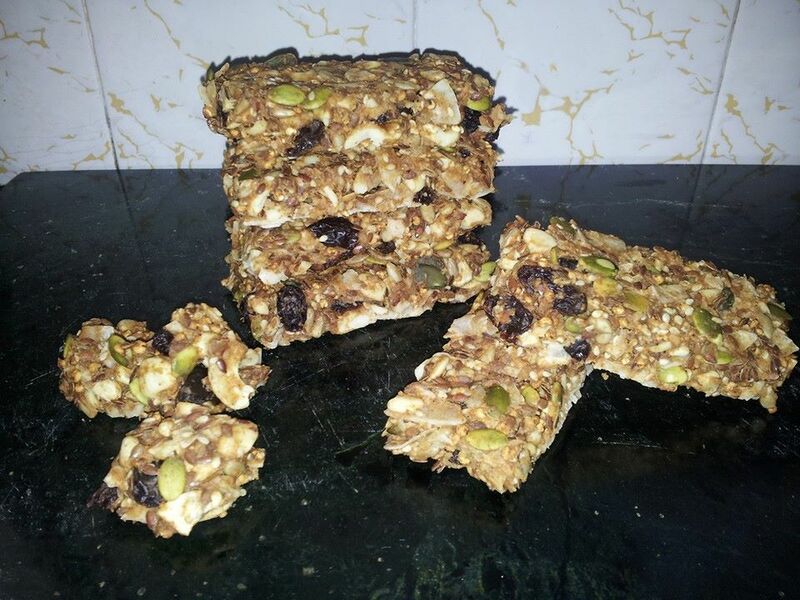 Simple & Healthy Muesli Bars – that your kids will love! The perils of porridge… leftover porridge! What to do with pre-soaked oats that no one wants the next day for breakfast? I thought about feeding it to our daily ducks, but then i thought about muesli bars and i just had to try to make some. I actually didn’t use a recipe for these and i encourage you to do the same! Branch out, take a risk, be bold, be brave… make muesli bars! These can be made completely RAW if you so wish. My recipe used a dehydrator to “cook” these but i used cooked porridge as the base so they aren’t entirely raw. If you want to make them totally raw just use pre-soaked oats as your base – it will yield the same results. Muesli Bars & Muesli Bites! Cashew pieces, pepitas, sunflower seeds, sesame seeds, linseeds, coconut flakes, raisins – or use any combo of seeds/nuts/fruits that you have. Add 2 tablespoons each of Raw Honey & Organic Peanut Butter and a teaspoon of Cinnamon. Mix it all together. The mixture should stick together and have the ingredients well combined. I lined a small shallow tin with baking paper and spread my mix out evenly and flat, then popped in the fridge to set for an hour or so. Remove from tin and using a large sharp knife, dipped in water, slice your bars and load on to your dehydrator trays. Alternatively, you can bake at a low oven temp until they are crispy and ready to eat! I dehydrated mine on a medium setting for up to 18hrs and they were deliciously crispy. The bites were only dehydrated for half that time! If you’re worried about if they’re done – taste one! If its too soft, cook it more. Please feel free to play around with this recipe and let me know how you go… i would LOVE to see YOUR results! !